A scene from an October episode of "C.S.I. 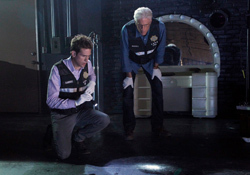 : Crime Scene Investigation," with the actors Eric Szmanda, left, and Ted Danson. LOS ANGELES — Crime continues to pay, at least where the "C.S.I. : Crime Scene Investigation" television franchise is concerned. Content Partners, a financial boutique that buys the future cash flow due stars and others from their screen and musical work, said on Wednesday that it had agreed to acquire the half of "C.S.I." owned by an affiliate of Goldman Sachs in a deal that makes it a co-owner, with CBS, of the long-running series and its spinoffs. Goldman's GS Capital Partners investment arm had acquired the stake through its purchase, in 2007, of an interest in Alliance Atlantis, a Canadian entertainment company. Early this year, GS Capital Partners and others sold the Alliance Films unit to Canada's Entertainment One. When completed, the "C.S.I." transaction will become the largest purchase for Content Partners. The company was created in 2006 by Steven H. Kram, a former William Morris Agency chief operating officer who is now the Content Partners chief executive, and Steven E. Blume, who was previously chief financial officer of the Brillstein-Grey management company. The entrepreneur Todd Wagner and the investor Paul Wachter are among its partners, and Mr. Wachter helped structure the current deal, Mr. Kram said. "This proves the value of liquidity in an uncertain economic environment," Mr. Kram added. He spoke recently by telephone of his company's ability to use resources from its investors and lenders to buy an asset of the kind that is usually owned by large media companies. Bank of America and JPMorgan Chase provided financing for the purchase, he said. For more than a decade, the "C.S.I." franchise has been among the most profitable of television properties. According to the firm Media Metrics, the original "C.S.I.," which is now in its 13th year on CBS, was the most-watched television show in the world last year, the fifth time in the last seven years that it has earned that ranking. And in one of those years, its spinoff, "C.S.I. Miami," was the most-watched show. The worldwide audience for the original "C.S.I." has frequently surpassed 70 million. While "C.S.I. Miami" was canceled last year, the original and "C.S.I. : N.Y." remain on the air. The latter is considered a show "on the bubble," which means this could be its final season. But the original "C.S.I." still generally wins its 10 p.m. Wednesday time period, and even after 13 years, averages 11.2 million viewers a week. A 14th season is all but certain. In terms of historical value, the "C.S.I." franchise, which includes 724 one-hour episodes, is almost surely at or near the top among television series, having generated billions in profits. That outcome makes it one of television's cautionary tales because the show was originally the property of the Walt Disney Company, which walked away from ownership in the series when it landed at CBS. At the time, some Disney executives did not believe shows on CBS could attract the kind of young viewers needed to be successful. CBS needed a last-minute partner to pay half the production costs before "C.S.I." could go on the air. Alliance Atlantis became that company and gained a half share in one of the greatest gold mines in entertainment history. The newly purchased stake, he said, does not include revenue participations that may be owed to the "C.S.I." stars or creators, whose ranks include the producer Jerry Bruckheimer. Such rights are still owned by actors or others and are not part of the production companies' share of revenue. A version of this article appeared in print on March 7, 2013, on page B3 of the New York edition with the headline: Television's 'C.S.I.' Gets New Financial Partner To Replace Goldman.